New hope for damaged steam table pans! If you are tired of damaged steam table pan lids raise your hand! If you are tired of noisy pans rattling as you transport them through the kitchen Raise your hand! If you are tired of your portion utensils falling into your pans of food, one more time, Raise your hand! We are pleased to introduce you to the new CaterSeal Food Pan Gasket! New to Cook’s Correctional, the CaterSeal Food Pan gasket is here to help and solve this problem for you. Just wrap the CaterSeal gasket around your steam table pan and lid and your operation has improved instantly. No more mess from spillage and easier clean up in your foodservice operation. You’ll also improve the efficiency of your serving line because the gasket is a barrier to steam escaping from the gaps between pan and well. You can now put your hands down, no more rattling, denting, spilling or noisy pans! This is the third and final post (in this series) on Tray Delivery Carts and things to know or think about prior to purchasing. Our first blog post was on the questions we ask our clients before recommending or quoting carts (click here for Part 1). Our second blog post was on general facility and cart questions that should be answered before making a purchase (click here for Part 2). This post is going to cover some of the various cart options available to you that you should consider as you review your Tray Delivery Cart options. 1. Will you be holding or transporting things on the top of the cart? You can find carts that offer a sheet pan rack for 18″ x 26″ pans. These can be open, enclosed and even insulated. You will want to think through how many pans you would want to carry and the spacing. If you do this, you need to also consider how much space you will need above the cart to fit the rack. Rather than product on sheet pans or in steam table pans, will you be transporting Beverage Servers? You’ll want a rail on the top of the cart to keep them in place. You also want to consider how tall the cart is because someone needs to be able to put the fully loaded beverage servers on top of the cart. If you have a five gallon beverage server – it will weigh 40 lbs. fully loaded, as a gallon of water weighs 8 lbs. A rail can keep wash racks in place too, if that’s how you’re transporting tumblers or mugs. A top rail can be three-sided which allows you easy access to load the top of the cart or it can be four-sided which keeps things in place more easily. 2. Will you be doing any assembly at point of delivery? You may want to consider a work shelf option. These are available in pull out or flip-up styles. You will need to consider where you would like it located on the cart, the size and the height you want it to be above finished floor. 3. Are you purchasing heated carts? If you are, do you want a thermometer on the outside of the cart that tells you the internal temperature of the cart? This is a really good idea because then you’re not opening the door and letting the heat out in order to make sure it’s at temperature. Consider how many thermometers do you want on the cart and where you want them to be. 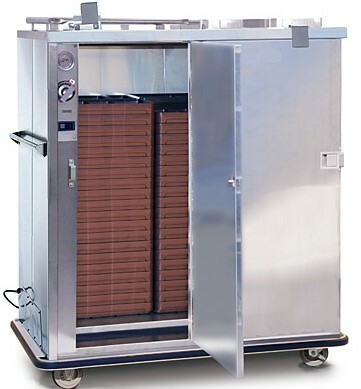 A nice option to consider is a cart with a removable heater because it can extend the life of the cart. By removing the heater before you wash the cart you minimize potential for damage to the heater. Additionally, with a removable heater – if the heater goes, you can replace it pretty easily. 4. Have you experienced damage in your facility from carts or have specific failure areas on your current carts? You may want to review options for special bumpers beyond the standard 1″ vinyl. You may also consider wear plates, which are extra stainless. Be sure to specify where you need these to be located. There are also options for a top bumper which adds additional protection to walls and cart. 5. Do you want to gang carts together? A tow hitch can be used to create a string of carts. Tow hitches can be ball style, pin or ‘C’ Clamp. If this is a new option, you’ll want to consider who will actually tow – is it the inmate or the staff, and how many carts will be towed at one time. Keep in mind that there is typically NO warranty beyond towing ONLY two carts at one time. 6. Do you have any special considerations regarding the doors? There are options like a magnetic latch which helps to keep heat in by closing and sealing the doors. Do you want your door pulls to be flush? This can ensure there are no handles to get in the way in tight spaces. A special transport latch will keep the door latch covered so that it stays closed. You may need to specify a security latch or locking latch so that you don’t have any concerns about contamination during transport. Meal Delivery Carts are a large investment for the correctional kitchen and they will impact your meal serving operation significantly. Any time you spend before hand making sure you get what you need, what you want and what will work is time well spent, and possibly dollars not thrown away. If you need help with on carts or other equipment, all the Cook’s Correctional sales reps are trained on our products we have lots of experience that we’re ready to share with you.